Florida is one of the fifty states of the United States of America. It is notable for being a large peninsula and having a warm climate. 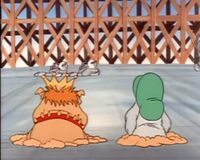 Florida is visited in The Adventures of Super Mario Bros. 3 episode "Life's Ruff", when Hip and Hop Koopa flee to Miami through a Warp Pipe while escaping from Luigi and King Windbag, whom they had transformed into dogs. Most of what happens in Florida takes place in either Miami, Florida State Poochitentiary, or the Kennedy Space Center. As Hip and Hop make their way towards the Kennedy Space Center in a sports car, they drive recklessly through Florida, to the point where the police issues an emergency report, telling everyone to stay inside. This page was last edited on August 19, 2018, at 21:26.